If you asked most people what’s been one of the biggest exports to come from the seaside town of Great Yarmouth in Norfolk in the last 15 years, then they may be surprised to recollect that the band behind our featured classic hit today was one of them. Arriving in a spandex clad blaze of glory with the release of a low key single ‘Get Your Hands Off My Woman’ at the back end of 2002, The Darkness – fronted by charismatic, catsuit donning and highly voiced Justin Hawkins – arrived at a point where rock music had gone well, a bit serious. To describe them with hindsight, it’s not unfair to say they were offering an updated take on the outlandish stylings of Queen, Meat Loaf – hell, even a bit of Jeff Wayne’s War of the Worlds. Winning over industry bigwigs, they were instantly snapped up by Atlantic Records. ‘Growing On Me’, their first single proper for the label, had gone first in June 2003, reaching a respectable #11. But it was only once they opened for a certain Robbie Williams at his mammoth open-air shows at Knebworth that summer, that sales of their debut album ‘Permission To Land’ went through the roof. 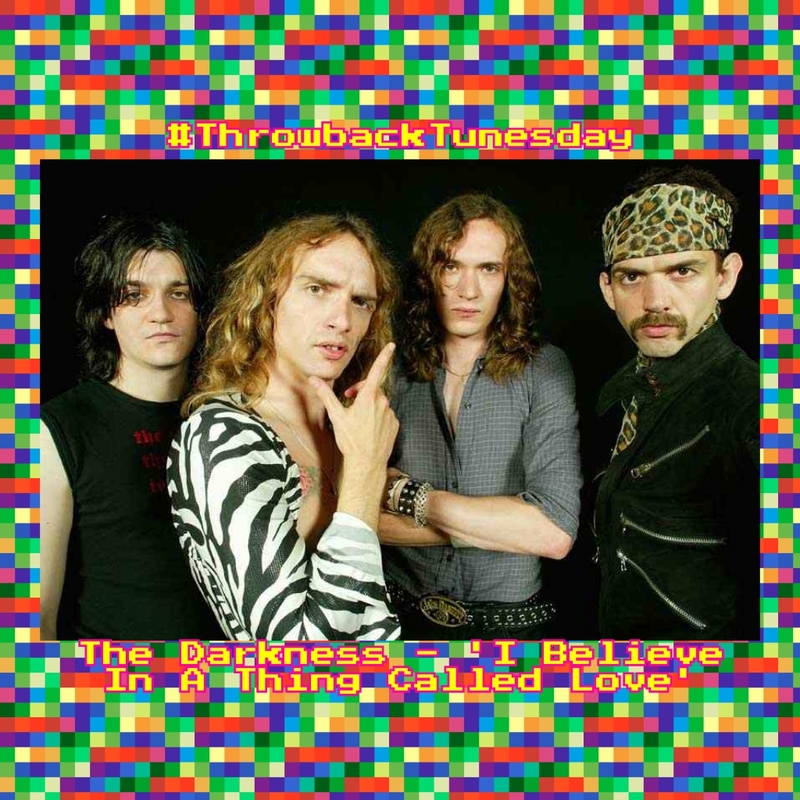 It made the focus around their next single – and what arguably became their signature anthem – ‘I Believe In A Thing Called Love’ all the greater too. Despite initially challenging for number one midweek, by Sunday after it’s release it had debuted at #2, whilst the all-conquering reign of Black Eyed Peas’ “Where Is The Love?” continued on. Numerous awards and industry plaudits came their way in the following year, as well as a Christmas single that didn’t quite make it to the festive top slot. But back to this week, and to The Darkness, the band who bought the shock and very British flamboyance back to rock.